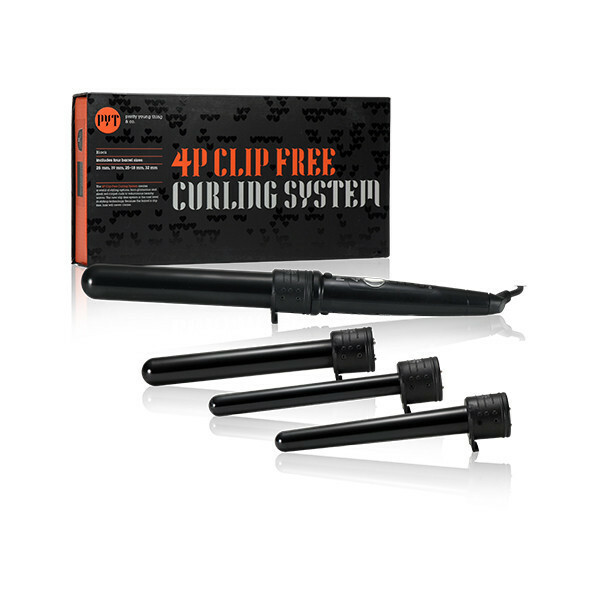 Clip Free Curling Wands are replacing Curling Irons as the top tool to create curls, waves, and loose spirals. This new technology creates the styles you want with ease and eliminates the creases, lines, and breakage caused by traditional clip curling irons. This 4 piece set features 4 high grade tourmaline barrels. The barrel sizes are 13-9mm, 25-18mm, 19mm, & 32mm. These are quickly interchangeable to the handle and allow you to create a variety of sizes. The tourmaline barrels create negative ions and far infrared heat to seal in moisture, reduce frizz and create a lasting shine. The system features and adjustable temperature up to 430 degrees, is dual voltage for worldwide use (US plug), and includes an heat resistant glove.